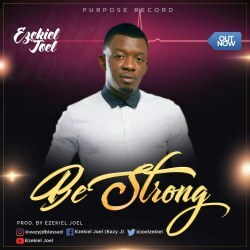 Ezekiel Joel Is A Worshipper, Song Writer, Song Minister, Recording Artist, Music Producer, Sound Engineer. Who’s Genre Of Music Is Tagged To Be *Sensational Gospel* By Most Of His Listeners Base On How Inspiring And Uplifting His Songs And Sounds Has Been. Be Strong Is A Song Given By God In Order To Infuse Strength To People That Might Been Going Through A Tough Situation Now, That No Matter How Stressful, Fearful And Tearful It Might Have Been, There’s A Place Call *Rest In God* And There’s A Need For Us To *BE STRONG* By Building Our Confidence In God’s Promises For Us. Joshua 1:9.